Urgent Call to Action: Free Zakaria Zubeidi ! On the 9th of September Zakaria Zubeidi announced that he will embark on a death fast, a complete food and fluid strike, in response to the continuous postponement of his release from Palestinian Authority prison. This effectively means that unless the Palestinian Authority releases Zakaria he will most probably not make it through the week. Zubeidi, co-founder of The Freedom Theatre and former leader of the Al-Aqsa Martyrs’ Brigades, has been imprisoned by the Palestinian Authority for close to four months. 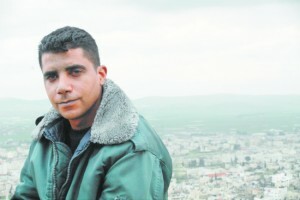 No charges have been made against him, no evidence presented and throughout his imprisonment his rights have been severely violated, as described by among others Human Rights Watch (http://www.hrw.org/news/2012/07/27/israelpalestinian-authority-theater-group-hit-both-sides). Being one of the last survivors of Arna’s Children, Zakaria joined the armed resistance during the second Intifada and became one of its leading figures. After co-founding The Freedom Theatre in 2006 Zakaria decided to lay down his weapons in order to join a cultural resistance, which he deemed a more powerful tool against the Israeli occupation. Surviving numerous assassination attempts by the Israeli army and vowing to never again enter an Israeli prison, Zakaria is now instead facing death in a Palestinian prison unless immediate action is taken. Contact the local representative office of the Palestinian Authority(2) and demand Zakaria Zubeidi’s release. Since the situation is urgent we also ask you to take more direct actions such as organising protests at PA representative offices. Contact local or regional human rights offices and organisations such as Amnesty International and urge them to take action. Contact your local MP and MEP and urge them to take action. Contact your country’s representative office in the occupied Palestinian territory and urge them to take action(3). The Freedom Theatre will continue to monitor Zakaria’s case closely and we will keep you updated.